For over two years, I used Apple’s Reminders as my task management app. Contrary to expectations from Internet friends and colleagues who swore by more complex solutions, I was fine with Reminders and I didn’t need anything more. It started in late 2012 after I realized that I was spending more time tweaking OmniFocus than getting stuff done. OmniFocus is an excellent suite of apps – especially with the new version 2.0 for OS X and iOS 8 – but, because of its high customizability, I was constantly finding excuses to fiddle and improve instead of doing and moving on. I wrote scripts, changed its settings, played with the URL scheme – I tweaked OmniFocus because I could and because it was fun. I was removing friction from the app, but the time I spent tweaking and hacking around could have been used completing tasks rather than coming up with ways to make them prettier and geekier. So about two years ago, I switched to iCloud Reminders as my primary todo app, telling mysef that I’d never cede to the temptation of optimizing my task list again. 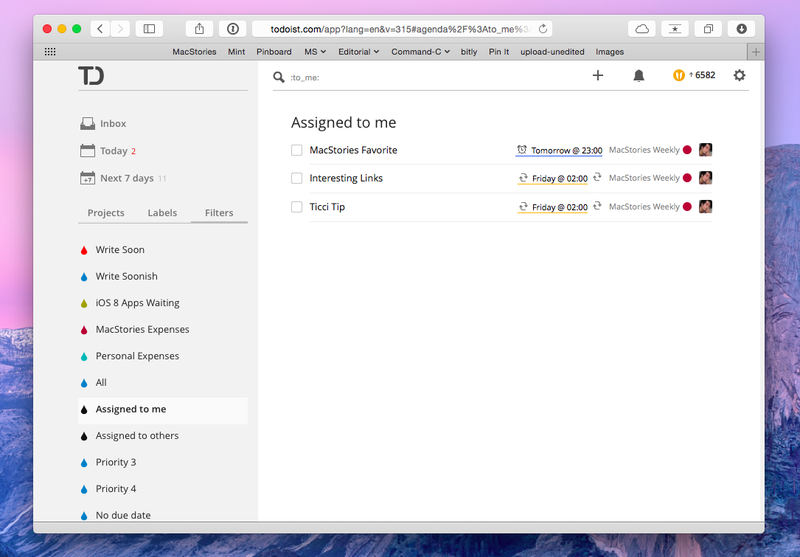 Reminders had everything I wanted: I could create multiple lists, there were no contexts and projects to learn, I could assign due dates, and task notes supported clickable URLs. My todos consisted of lists of links to apps/news/emails I needed to check out, and Reminders offered just the right amount of functionality for an individual user who was tired of more complex apps. More importantly, iCloud sync was surprisingly fast and reliable, and Reminders worked with Fantastical. I was using Apple’s native Reminders app for the iPhone and iPad, but I wasn’t a fan of it: while Apple’s app covered the basics well and it first featured a widget in iOS 7’s Notification Center, it didn’t come with the natural language input and the great balance of simplicity and power-user details found in Flexibits’ app. So when Flexibits brought Reminders support to Fantastical for the iPhone and iPad, I was fully immersed in the Fantastical ecosystem for events and todos. For more than a year, Reminders and Fantastical were the perfect combination for me. The underlying backend was stable and straightforward so I didn’t have to worry about my tendency to fiddle and optimize productivity instead of being productive, but Fantastical was also flexible enough for me to be faster with keyboard shortcuts, Launch Center Pro actions, and a simpler visualization of tasks through a unified list and a thoughtful use of colors. I consider Fantastical one of the best apps ever made for iOS, and it served me well throughout 2013 and the first half of this year (so much that I even recommended it to my doctor). Around five months ago – immediately after Apple’s WWDC ‘14 – I started putting together MacStories’ plan for the launch of iOS 8 because I knew that, for me and our audience, the changes we’d see in the OS were going to be something special. I decided early on that I wanted the MacStories team completely focused on iOS 8 for the whole summer, and that meant that I had to start talking to dozens of developers and PR people to test new apps, ask questions, and write reviews. I expanded the team’s scope to include articles from new freelance writers, and I settled on about 20 in-depth articles we needed to have ready by iOS 8 release day. For three months, I tested apps (over 50), talked to developers, and spent my days writing and organizing coverage with my team. At the same time, my girlfriend and I started looking for a new apartment in Rome, which, as you can guess, also is a time-consuming process with lots of planning and collaboration involved. Then, in August, Graham and I began outlining the details of what would become the weekly MacStories newsletter that we send out every Friday (we haven’t missed a single week so far). And, following the launch of Relay FM, I renewed my committent to our two podcasts – Connected and Virtual – as I want to make better shows every week. In short, I took on new projects, increased my efforts on existing ones, and I started collaborating with more people. And soon after my daily schedule was altered to include all these new individual and collaborative tasks, Reminders showed its limitations and I completely lost track of what I needed to do, with whom, and when. Reminders isn’t built to scale for people who manage dozens of projects and collaborate with others to assign tasks and keep track of due dates. It’s not Apple’s fault – it’s right there in the name: Reminders. It’s not called “Projects” or “Todo Pro”: Reminders is a lightweight list system with support for dates, alerts, and lists shared with others. I guess it was naive of me to think that, with a growing business and changes to my personal life, I wouldn’t face an increased amount of responsibilities. Reminders couldn’t keep track of the new complexities and people in my life. I started forgetting about things I needed to do; sometimes I forgot to mark tasks as done so other people wouldn’t know what my status was; and, other times Reminders wasn’t working for them but I was forcing them to use it because “iCloud never had issues for me”. Both the Reminders app for Mac and Fantastical for iOS were overflowing with assignements and notes that were hard to find and that just kept piling on each other day after day. I need a list of things I have to do, otherwise I forget about them and I feel uncomfortable and disorganized because I think I’m forgetting something. I’ve always been this way: when I was in elementary school, I religiously planned homework in advance and tried to get it done as early as possible. In high school, I kept the same system but added mind maps (on paper – that was way before MindNode) to better outline topics and my studies. I need to visualize the stuff I need to get done, or it doesn’t get done because I’m terrible at remembering lists and dates. Therefore, I somewhat panicked when, back in July, I realized that I had no solid plan to get over 20 articles and the first issues of MacStories Weekly ready for September. But I also despise panic1 and I believe that the beauty of software lies in its interchangeability, so I started my quest for a new task management system that could last and scale. 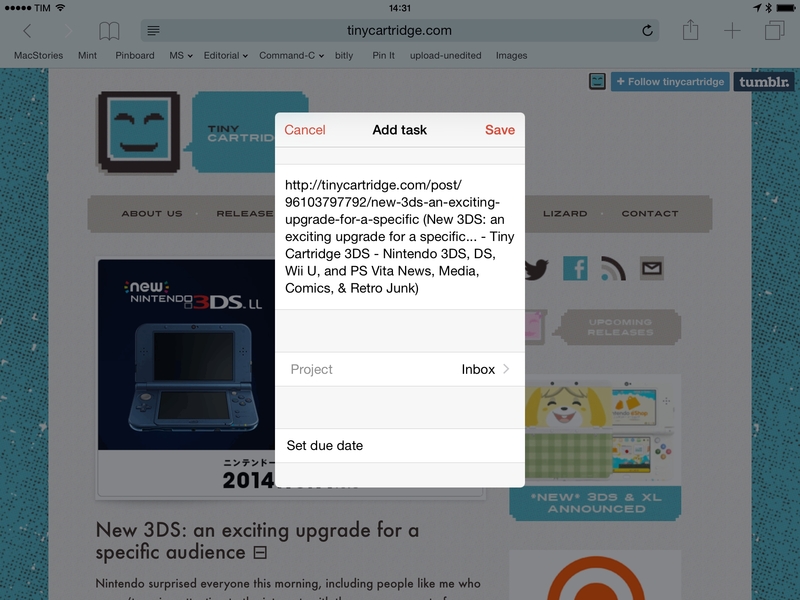 Ability to add comments, attachments, and URLs to tasks. I researched possible options for about a week, and I landed on Todoist. Launched in early 2007 by Amir Salihefendic, Todoist is a cross-platform task manager with over 3 million users. It has apps for iOS, Android, OS X, Windows, Chrome, and the web; it met all my requirements for what a scalable todo system should be; and, they have a freemium business model with advanced options unlocked with an annual subscription. It wasn’t the kind of todo app that is often recommended by people I follow, but its feature set seemed exactly like the kind of service I was looking for. 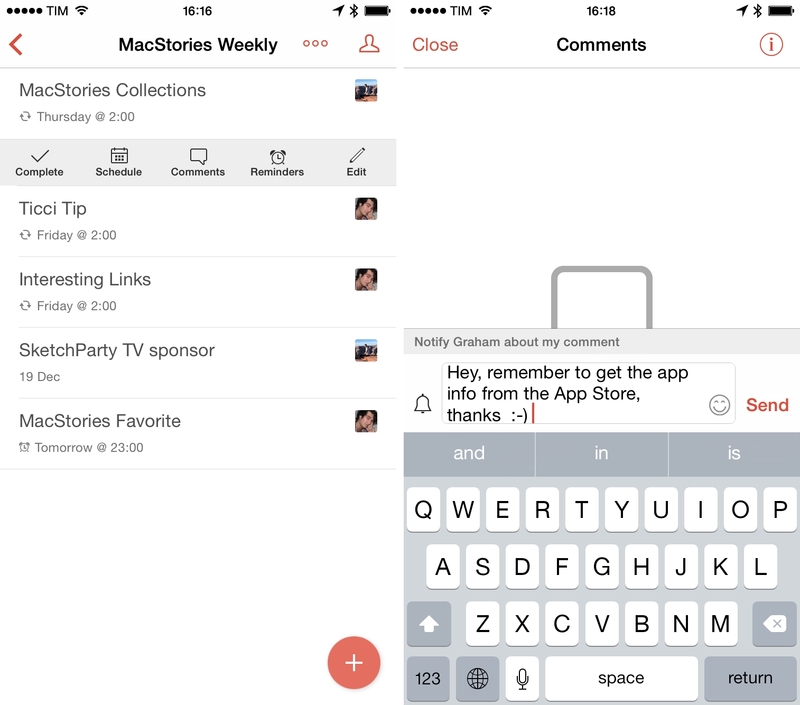 Todoist kept me sane when I was organizing MacStories’ iOS 8 coverage and planning the launch of MacStories Weekly. I’ve been using Todoist for three months now, and it’s become a key piece of my personal and professional life that prevents me from crumbling under the weight of tasks and projects that need my time and attention. With the launch of version 9.5 for iOS 8 today, I thought it’d be a good time to share my considerations on the service, some tips and tricks, and the details of how I rely on Todoist to get work done. 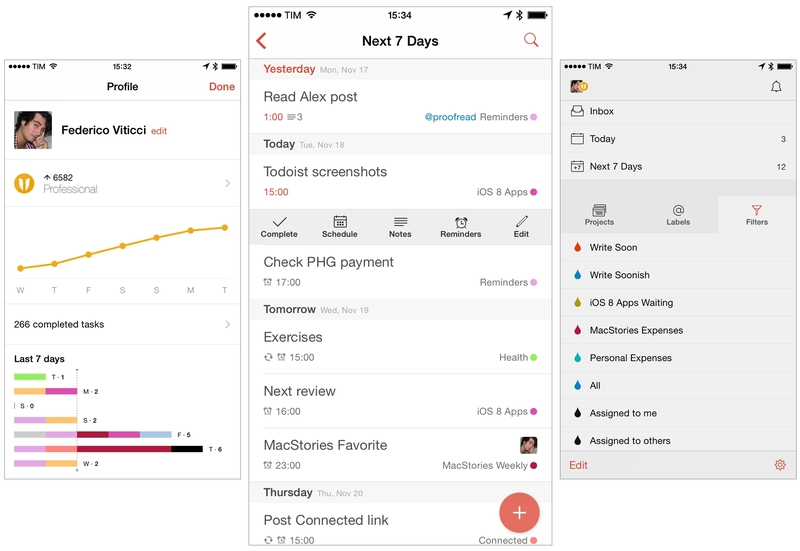 Todoist has native apps for multiple platforms, and its structure is consistent and based on a layout that applies to iOS, Android, and the web. I’ll mostly use the iOS app for examples in this article. Projects, Labels, and Filters as tabs. At the bottom of each content area (i.e. 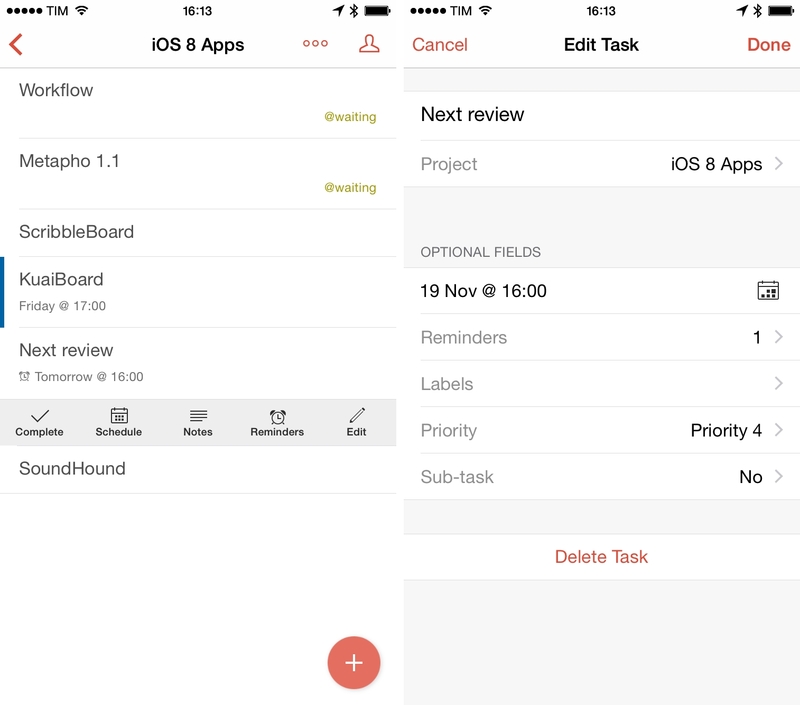 list of tasks), the iOS app has a large “+” button that you can tap to create a new task from anywhere; by default, the button will pre-fill the Project field depending on the view it was activated from. Editing a task in Todoist. How tasks are displayed is equally straightforward. Due times, labels, and projects are included as colored indicators in a task; when you tap a task, you reveal an action bar (a contextual menu on the web app) with buttons to mark as complete, reschedule, add notes and reminders, or edit. You can swipe a task to the left to quickly mark it as complete; the contextual menu of the web (and Mac) app has shortcuts to move a task as well. 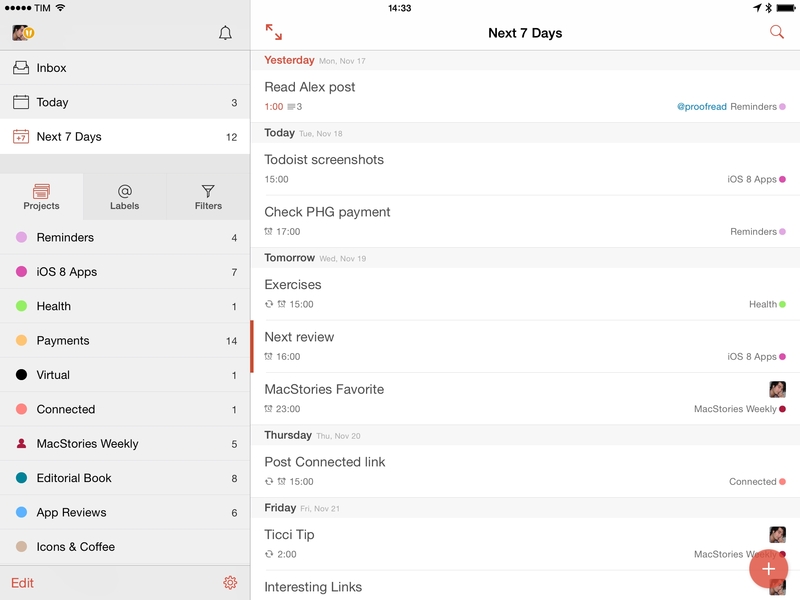 Todoist has a clean interface with a focus on text and colors. I find the Todoist interface to be rational and obvious. It makes sense. My most used views are the Today and Next 7 Days areas, as they offer a complete visualization of my day and week by coalescing all tasks from all projects in a list. I also make good use of the sidebar switchers for projects, labels, and filters, and I think that changing between these views with tabs is a good idea: there’s no deep or complex navigation required in Todoist – no multiple sidebars, no inspectors – and every tap in the sidebar changes the view on the right. There’s plenty of details that I appreciate in the Todoist UI. The rescheduling feature brings up a Mailbox-inspired menu to quickly postpone a task. 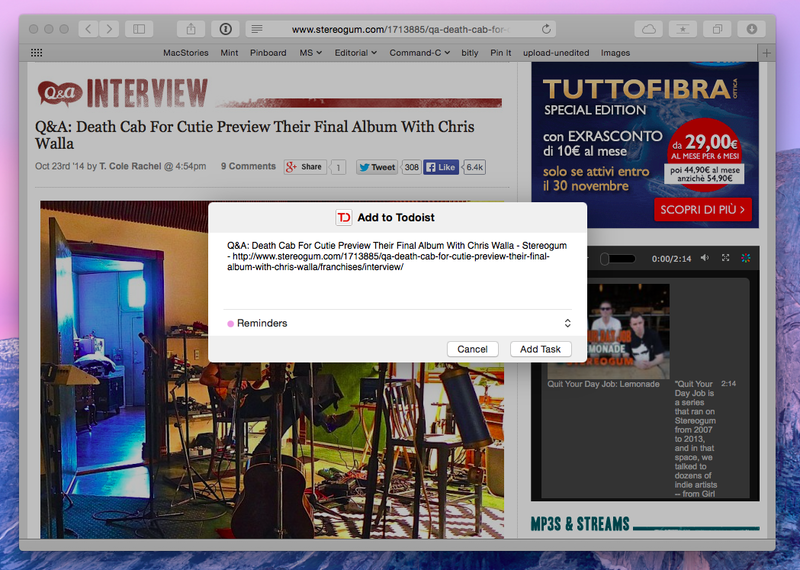 Links are clickable in task names and they open in Safari without having to assign them to a special field. 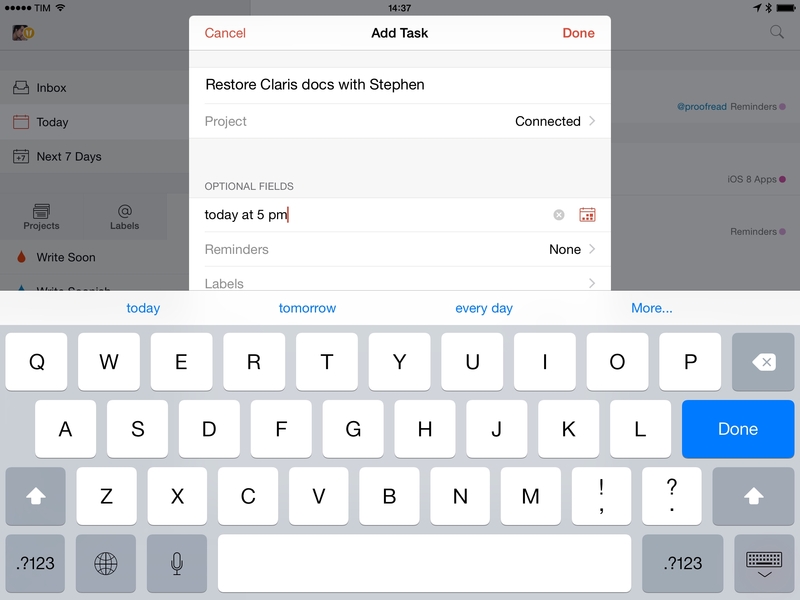 In the iPad app, you can choose to view your tasks in full-screen, hiding the sidebar. For a task manager with so many features, the Todoist team exercised admirable restraint to make the app as friendly as possible, hiding advanced functionality when not needed. The interface feels spacious and coherent; the sidebar packs just the right amount of options; and, once you’ve learned how Todoist works on one platform, you can pick it up on a different OS with no confusion. There is nothing inherently attractive or terrible about the Todoist interface – it looks good enough and it gets out of the way. It’s functional without unnecessary embellishments, and that’s what matters for me. Coming from Fantastical and its natural language support, I was concerned that a different task manager would have too much friction in trying to assign dates and times to tasks. That’s not the case with Todoist. Like Fantastical, Todoist lets you enter due dates using a human-readable syntax such as “tomorrow at 2 PM”. You can write commands as text in the date field, Todoist will parse them, and they’ll be added as due date and time to a task. There’s a whole set of commands and shortcuts supported by Todoist, which also accepts recurring tasks and regular dates. The natural language commands that I type in Todoist aren’t too complex, but I appreciated the recurring task syntax when I needed it. However, Todoist’s implementation of natural language processing isn’t as elegant or sophisticated as Fantastical’s. One of the best touches of Flexibits’ app is that natural language is parsed as you type, which lets you see if your commands have been understood correctly by the app. Through the use of animations, Fantastical makes natural language input natural by showing you how commands turn into events. Todoist, on the other hand, has a suggestion bar with shortcuts for some commands, but that’s it. When you type text in the due date field, nothing happens and there’s no visual cue to hint at the validity of a date you typed. Todoist tells you if a due date can’t be parsed correctly by bringing up an error message when saving a task, which works, but Fantastical is more polished. More importantly, the biggest difference between natural language in Fantastical and Todoist is that you’re not typing in a single field and letting the app figure everything out on its own. In Todoist, you’ll need to tap in different fields to type a task name, date, project, label, and more, whereas Fantastical is able to parse fields from a single sentence. This made Fantastical faster and easier to use for me: I could launch the app, type everything in one go, and trust that the app would parse all the relevant fields. 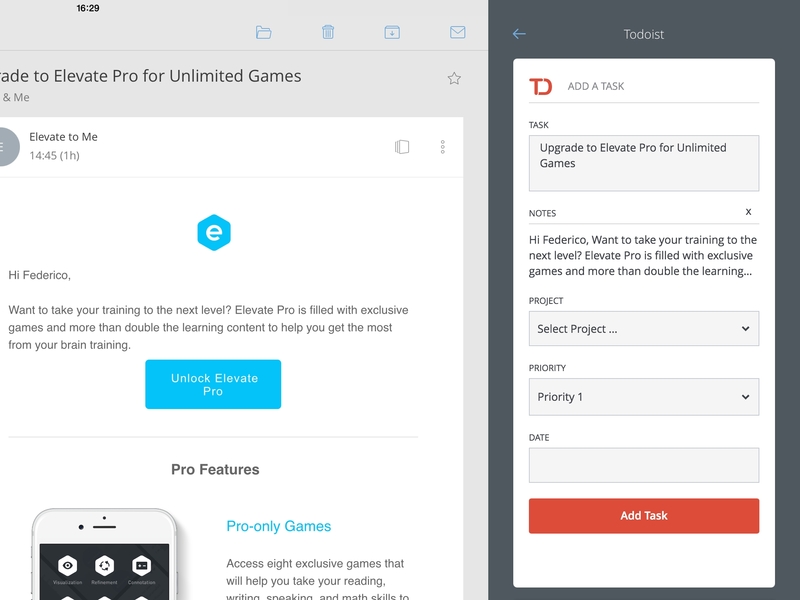 It’s a bit unfair, though, to compare Fantastical and Todoist from this standpoint. Fantastical has been built for information stored in Reminders and Apple’s Calendar – it doesn’t deal with collaborators, file attachments, labels, or sub-tasks. The basics of natural language input are more elegant in Fantastical, but Todoist deals with more aspects of task management. For my todo needs, Todoist has been fine for typing due dates quickly. Natural language in Todoist works in all the apps and even via URL scheme and API, which, in spite of the aforementioned UX differences, has made it easier for me to switch from Fantastical and Reminders to another system. 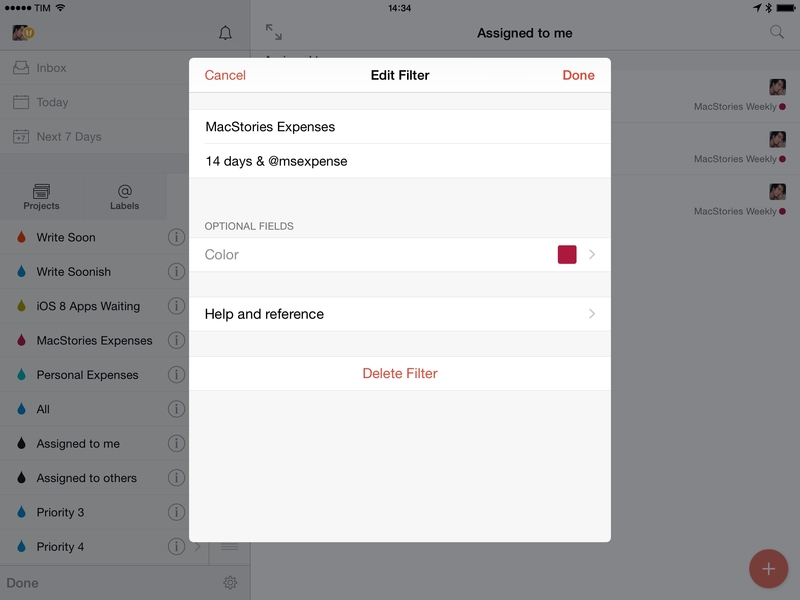 Filters are Todoist’s crown jewel and the feature that convinced me to replace iCloud Reminders. The ability to create custom filters allowed me to make sense of the amount of tasks I had leading up to September and today I rely on filters to easily see what’s due or coming soon. A filter lets you view a list of tasks based on specific criteria that go beyond the organization in projects and labels. For instance, you can mix-and-match time-based parameters with labels, text strings contained in task titles and notes, or other status types to create custom views that filter down your tasks in powerful ways. Todoist has a great selection of advanced queries that even support Boolean operators if you want to make sure you can always find a subset of tasks when you need it. Think OmniFocus perspectives, but based on a simple syntax and entirely under your control. For me, Todoist filters are useful because a) they can be quickly modified when my needs change and b) I can create similar filters with slight differences. In late August, I settled on the apps that I wanted to cover by iOS 8 launch day – I ended up having 10 app reviews, plus a few general articles about the OS itself. Writing my reviews is a time-consuming process that goes through multiple stages – writing the first draft, letting a few days pass, screenshots, a lot of proofreading – and I had lost track of my progress due the sheer amount of iOS 8 reviews I wanted to have. So I came up with a better system in Todoist that prevented me from going insane in the weeks leading up to September 17. I created a project called iOS 8 App Reviews and added all the apps I wanted to review to it. Then, I gave the ones I knew I wanted to have on September 17 a due date and estimated due time (MyFitnessPal went out in the morning; Instapaper in the evening), and I left all the other apps either without a due date (so I could cover them during the week) or with a “waiting” label (because I hadn’t received a beta yet). go – the article is ready to be published. Publish: articles that are finished and can be published on MacStories. Thanks to this setup – which wouldn’t have been possible with Reminders – I was better prepared for the launch of iOS 8 because I could easily “switch modes”. If I knew I wanted to write, I could open the Write filter and see what was in there; if I was in the mood for reading, I could switch to the Proof filter, grab a draft, perhaps send a link to Myke for a second opinion, and start reading. And as I went, I updated the labels on Todoist to modify the status of my tasks with the goal of having 15 articles with a green “go” label on September 17, which is what I accomplished. On September 17, I was completely relaxed and I spent the afternoon simply hitting Publish on WordPress and completing tasks on Todoist. One after the other, I published all my articles and, when I was done, I ordered a pizza and watched the traffic and Twitter comments come in. In two days, we had the page views we normally have in two weeks, and I genuinely believe Todoist was a huge help for my organization and stress levels. I was very relieved in the end. Creating a filter in Todoist. Todoist proved that it could scale thanks to its filtering system, but now my setup tends to be simpler. I don’t always need to prepare 15 articles for a single day – they’re more spread out, which means I can take a couple of days just to finish one ignoring the labels for proofreading and media as everything is effectively done in a single session. Right now, I just have filters for priorities and “waiting” apps for MacStories reviews, but I know that I can turn on the extra engines if things get hectic (what I did for the week of OS X Yosemite, for example). I have a couple of quibbles about filters. Project filters, available on the desktop, aren’t supported on iOS (they show an empty list), which forces me to create label filters for all the custom views I need on all my devices. And, I wish there was a way to pin filters to the top level of the sidebar (right under Today) so I’d have easier access without having to switch between tabs. I didn’t think I’d need filters until my life got busier. I found filters in Todoist to be more intuitive and versatile than other similar solutions in GTD apps, and they help me find and organize tasks across multiple projects on a daily basis. Todoist’s sync is fast and it happens in real-time. Every time I make a change, it shows up almost instantly on another device with no need to manually sync anything. I’ve never had any sync issue with Todoist (nor have I experienced any downtime), and changes like reordering filters in the sidebar appear instantly on other devices as well. It’s impressive. In Todoist, any project can have collaborators and any task can be assigned to a person. In my case, I set up shared projects for MacStories Weekly and Icons & Coffee so I can assign tasks to Graham and Silvia when I have to. Similarly, I can be assigned tasks so I can keep track of what I need to do and nobody forgets anything anymore. The “Assign to” field in the task creation screen only shows up for shared projects, which makes sense; task notes turn into comments for shared projects, and you can choose to notify collaborators of any change you make. Task assignments work with the filtering system, and I’m using the “Assigned to me” default filter a lot as it gives me a clean summary of all the tasks that other people are expecting me to take care of. However, I have a minor complaint about filtering tasks assigned to others: there’s no way to filter tasks assigned to an individual by name – only all tasks assigned to other people. You can work around this limitation by creating labels for people, but I’d like to see person filtering at a native level in the app. You can add context and information to tasks in Todoist by attaching notes to them. Notes can be textual comments, emoji, links, but also audio recordings and files imported from Dropbox and Google Drive. I haven’t used notes much personally, but they came in handy those few times I needed them. On a couple of occasions, I wanted to add some ideas and a screenshot to tasks I had for MacStories articles, and I was able to retrieve those later when I was in the process of writing. In my tests, Dropbox files got pulled in from my account with thumbnail previews whenever possible, but I noticed that files with an .md extension (Markdown files) weren’t supported by Todoist. I plan to use notes more in the future to attach files to tasks I’m delegating to someone else on my team. For instance, I already assign a few MacStories Weekly tasks to Graham in Todoist, and assets for revelant sections of the newsletter could be attached there instead of being shared over GroupMe with manual Dropbox links (what we do now). I see potential for notes in collaborative environments, but less for individual use as I’m already using apps that integrate with Dropbox directly. Using the Todoist action extension in Safari. The big news of today’s update to Todoist for iOS is the addition of an action extension to save webpages as tasks from any app. The extension is nicely done: in Safari, webpage titles and URLs are pulled in automatically and you can give the task a project from the extension sheet; you can’t type a natural a language date, but you can still set a due date and time with a manual control. 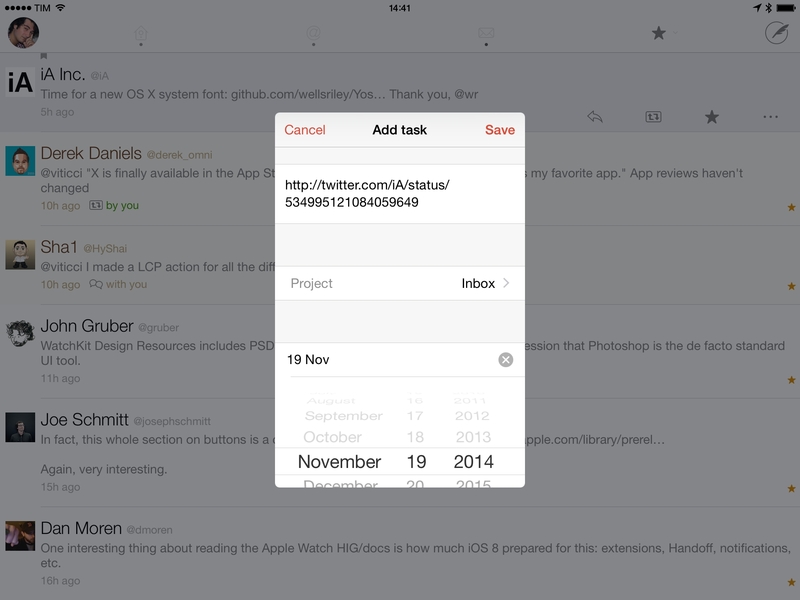 Saving tweets to Todoist from Twitterrific. The Todoist extension is able to accept text passed by any app: I can save tweet links from Twitterrific and Tweetbot, share text from Drafts, and save articles to my inbox using RSS readers like Digg or Fiery Feeds. Thanks to share sheets, this is close to having a mobile version of the system-wide quick entry panels that are popular in todo apps for OS X.
I’m happy with the iOS 8 widget, too. 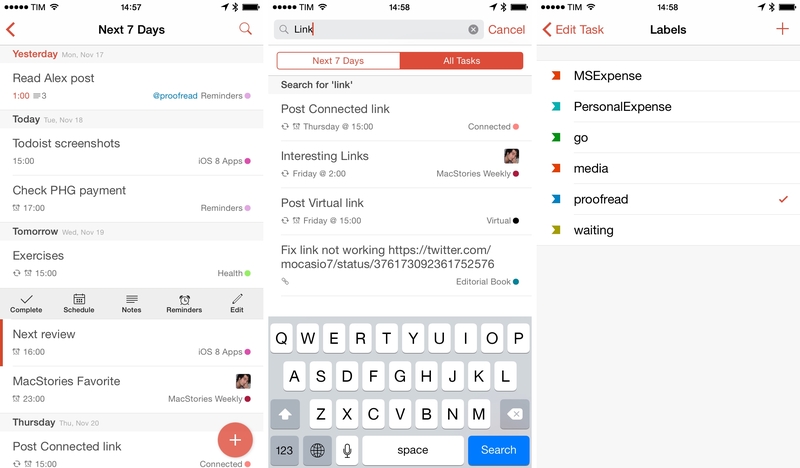 As you’d expect from an iOS 8 task manager at this point, you can view due tasks in Notification Center and complete them from there, but you’ll have to open the Todoist app for changes to sync across devices.6 Labels and projects show up in the Today view, and there’s also a link to open the Todoist app directly. Before iOS 8, this URL scheme could be used to automate task creation with a Safari bookmarklet, but that’s been made obsolete by the action extension. I primarily use URL schemes as shortcuts to open apps quickly these days; you can play around with Drafts and x-callback-url for some other nice ideas as well. I was positively impressed by the Todoist API, which is open to anyone and can be easily picked up. Accessing it in Python with pytodoist, I created a simple Pythonista script that asked me for task content and date and then created a new task directly in my account. This was before I got access to the app with URL scheme and action extension, but I remember noticing how simple the setup was and how fast tasks created via API propagated across devices. For end users, the important news is that the Todoist API has enabled third-party developers to build on top of the service with native integrations that can connect other apps to your todo list. As I mentioned in September, the popular calendar app Sunrise can be connected to Todoist and show tasks alongside events in your calendar. The integration is well done, and the Sunrise team is also working on letting you complete tasks without leaving the app. IFTTT, the popular web automation tool, can be configured to use Todoist triggers and actions. 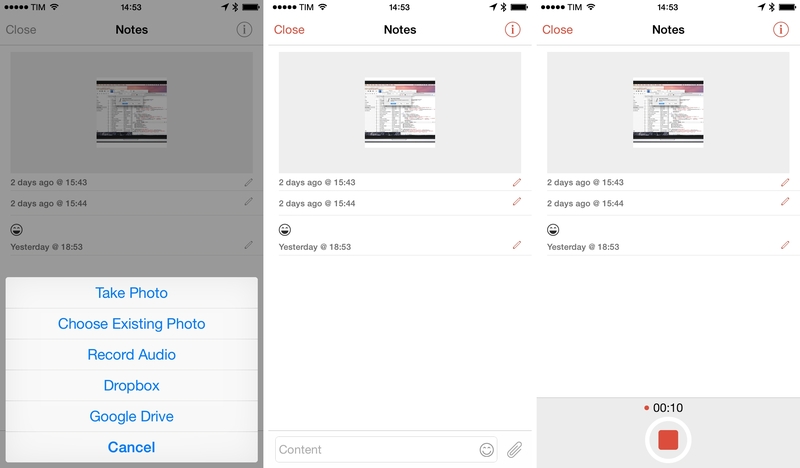 For example, I created a recipe that monitors a Dropbox folder for screenshots and creates a new task in Todoist every time an image is uploaded8, but you can come up with all sorts of other ideas such as archiving your completed tasks in a spreadsheet or turning an iOS reminder into a Todoist task9. My favorite integrations are the email ones. Dispatch, by far the most powerful email client for iPhone, was updated a while ago with native Todoist support: any email message can be turned into a task, and you can even add labels, a due date, and specify the return URL for the message so that Todoist will be able to reopen it in Apple Mail or Dispatch on other devices. On the iPad, I’m using CloudMagic to process email and convert messages to tasks. 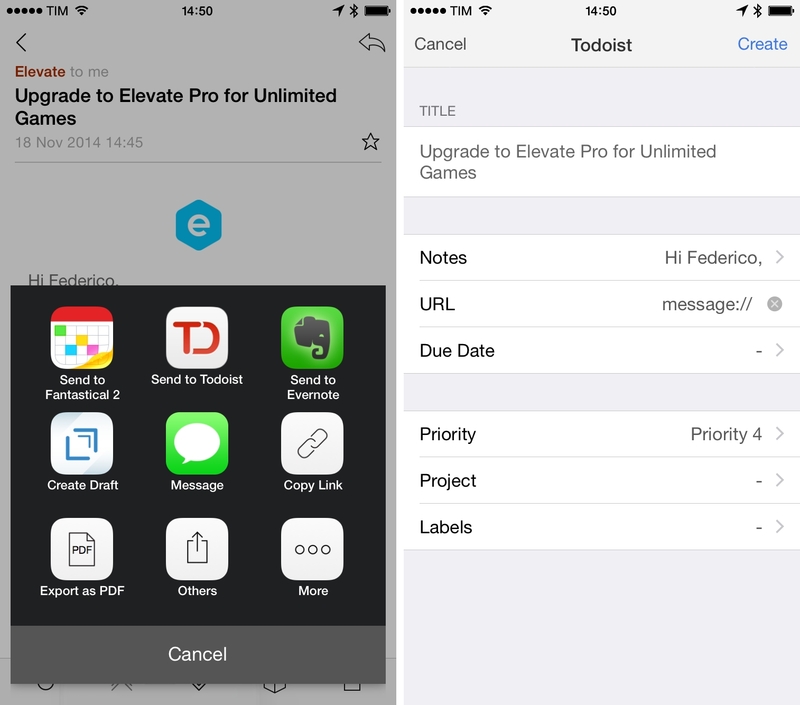 CloudMagic has integrations called Cards that, among various services, support Todoist with normal and quick add modes. The latter saves a message to your Todoist inbox with one tap, whereas normal mode lets you specify labels, project, and priority before saving. I like the integration with CloudMagic when I’m on the iPad, but it isn’t as convenient as Dispatch as it doesn’t let me reopen messages later. For a service that I usually don’t see mentioned in our geeky corner of the Internet, I was surprised to see a large amount of integrations and automation possibilities in Todoist. IFTTT (or Zapier, if you’re looking for a paid alternative) and Dispatch are especially well done, but I’m also glad that its developers have built a URL scheme for those who rely on old-school iOS automation. I don’t use Todoist on my Mac much, but I downloaded the Mac app for Yosemite when it was released last month, and I like the additions it brings. I say “additions” as the app is a native wrapper for the Todoist website, augmented with a share extension, Notification Center widget, and quick entry from the menu bar. The first two are rather obvious, but welcome nonetheless. You can send webpages from Safari to Todoist, and you can complete tasks from Yosemite’s Notification Center without switching to the app. Quick entry from the menu bar is my favorite aspect of this desktop conversion. You can bring up the Quick Add menu by clicking the Todoist icon or hitting a keyboard shortcut, then you can start typing and tab through fields to assign a project and dates. It’s nothing revolutionary if you’re used to apps like Things and OmniFocus, but I’m glad it’s there. I saved my second favorite feature of Todoist for last because it’s unlike any other task manager I’ve tried over the years, and I believe it’s a fantastic idea. In most task managers, tasks disappear when they’re marked as complete and they’re archived in a Completed list in a reverse chronological order. 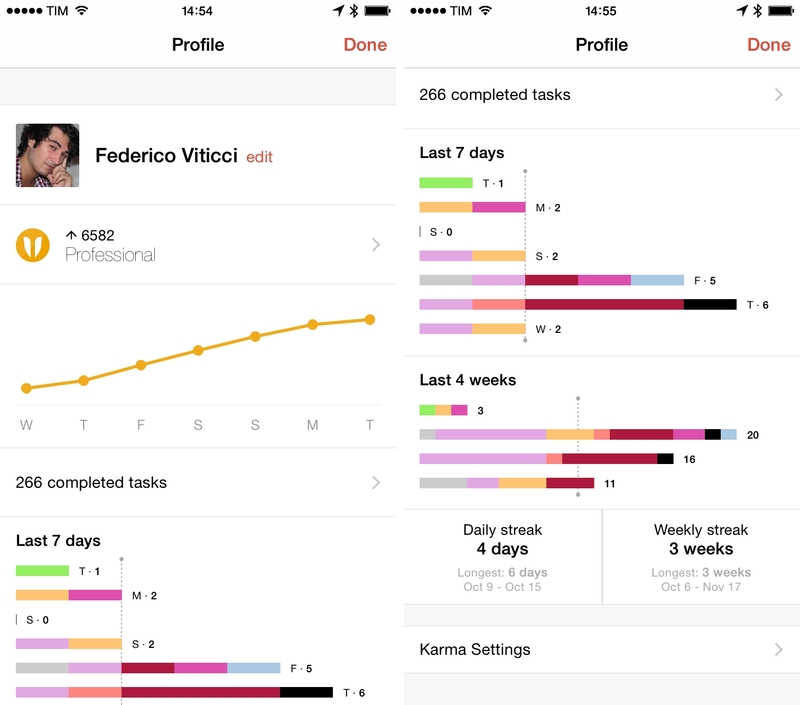 Todoist has this too, but they also came up with their own progress-tracking and reward system called Karma that visualizes your productivity and commitment over time. The road to enlightenment is long and paved with app reviews and Skype calls. For each completed task, you get points that fill your Karma level. As a user, you get access to 8 different levels from Beginner to Enlightened – the point being, if you keep using Todoist and stick to your todo list, you’ll get points and you’ll unlock levels and you’ll feel good about yourself. Right now, I’m a “Professional” with just over 265 tasks completed and 6582 Karma points accumulated so far. There’s no other “gamification” process involved and the Karma screen never gets in your way – you have to open it, and it’s just about points and feeling good about your progress. And for me, it works. I don’t know what part of my brain gets triggered by Todoist Karma, but I want to make sure I’ve done everything in my todo list by the end of the day because I like unlocking points and seeing the graph that charts my productivity for the past week. I’ve been procrastinating less and I feel more productive than ever, and while that’s primarily related to the fact that I want to be a better independent writer and podcaster, Karma plays a role in keeping me focused and on track. The Karma screen is also useful from a mere analytical standpoint. Todoist shows you daily and weekly streaks (which you can configure in the settings) as well as a weekly breakdown of tasks you’ve completed on each day based on their color label. There’s a vacation mode you can activate, or you can disable Karma entirely if you’re not interested. Karma is what differentiates Todoist from other task managers in my opinion. While most apps are limited to storing and archiving tasks, Todoist brings some meaning to what I accomplish every day, making the classic todo list a little more personal. During this transition, I’ve thought about how good Fantastical is for Calendar and Reminders integration on the iPhone and iPad. Its natural language processing is top notch, the interface is elegant, and it’s full of power user features such as keyboard shortcuts, URL schemes, and the ability to easily open links in Safari. Fantastical is so much better than Apple’s own Reminders app, you wouldn’t think they actually share the same backend. I’m still using Fantastical every day for my calendar. Todoist strikes a good balance of powerful features and clever implementation that doesn’t push me to customize everything all the time. I’m not writing scripts for task management, I’m not changing icons and themes – I set up a few filters and I’m just focusing on doing stuff. 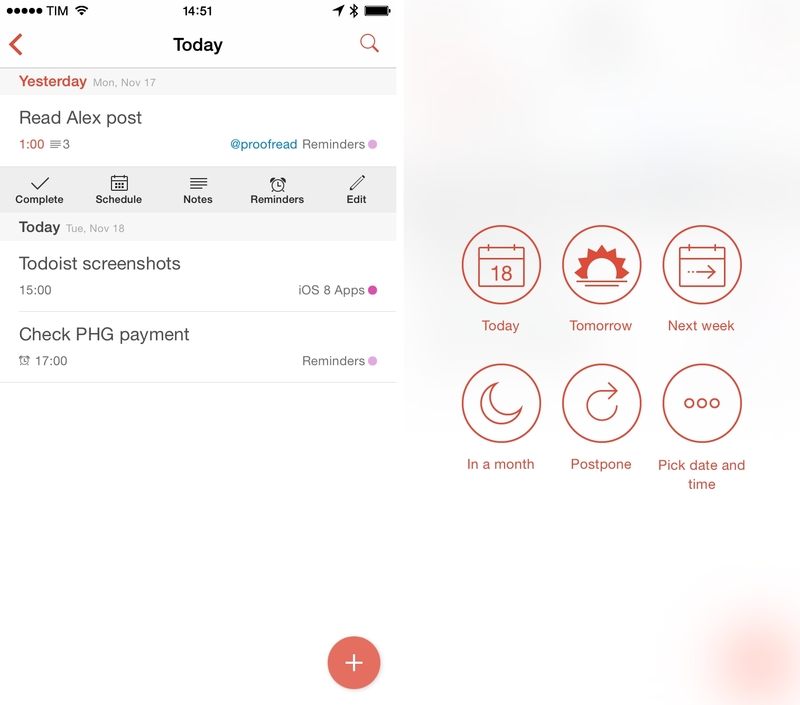 The Todoist app for iOS integrates well with iOS 8, and, overall, I’m thoroughly satisfied with my decision to switch from Reminders to a professional-grade todo system to manage my life.